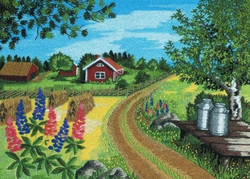 The American Bunka Embroidery Association will hold its anual meeting and stitching classes in Charlotte North Carolina in 2013. Registration forms are due June 1, 2013 to ABEA Treasurer. Rate: $139 Single/Double $149 Triple $159 Quad. Mention BNK to get rate. Note: Rate includes cooked to order breakfast and nightly managers reception beverages and snacks. Size 8 kit. Teachers Diane Bergeron and Vicki May. In 2013, depending upon the numbers of students who register for an orignal class, it may be consolidated within the Open Class. Check back for more info as the year passes Teachers Lila Lansrud for Original and TBD for Open.